Why Are Christians Defending Hip hop? To persuade those of you who aren’t hardened in your bias to believe that there are many Christians who are apart of the hip hop people group but are more interested in the advancement of the gospel of Jesus Christ than hip hop itself. To encourage the Church not to shrink back from embracing Christian ambassadors of Jesus Christ who properly submit their hip hop-ness to the lordship of Jesus. To To explain why “Christian hip hop” is something that is being made too big a deal of. To encourage greater thought and research among those Christians who have good intentions, but have never biblically worked through the complex issue of the Christian and hip hop. It’s so villainous, it’s so sinful; it’s got to be demonic! Why are you Christians defending hip hop? Lately I keep hearing this question and I look in all directions as if to say, “who me?” I’m not defending hip hop! Don’t get it twisted, I know that a lot of people are defending hip hop, but I’m not apart of the camp that feels that need. However, for almost 14 years I have been on a mission to reach the hip hop people group with the gospel as an indigenous missionary to the culture. Every so often I am forced to provide a biblical defense for my claim to be called to reach hip hop culture, and more specifically to reach it indigenously (as a native to it). This current defense would not even be necessary if there had not been a recent revival of anti-Christian hip hop sentiment. This sentiment is from of old, and it is an attempt to make the church detest the hip hop culture to the point where the church ceases to be a missionary to it, and ceases to be a haven for those Christians who consider themselves to be apart of the Christian hip hop community. Let’s dive in. Recently it seems as though hip hop has become the new hot topic in the church. Pastors are buying DVD’s and having their whole congregations (not just the youth group) look at it. They are having discussions and forums about hip hop and often the conclusion is “away with hip hop—away with Christian hip hop!” Long before Craig Lewis’ rise to church-fame many Christians like myself were boldly and radically living out the glorious Christian faith with many of the non-sinful aspects of hip hop still visible. There were talks of us looking like the world, but as our Christ-like character shined it became difficult for our critics to deny the fact that our primary allegiance was to Christ. Several of our critics became our allies as they became convinced that we were not advocates of the sins within hip hop, only advocates of Christ being lord of the non-sinful elements of hip hop. Daily we lived out the commands of Christ in the sight of a world that was growing in regards to its hip hop orientation. During that time, the church hailed us as beautiful models of what it meant to be in but not of the culture. It was as though we had become a display of Christ-likeness with a hip hop twist. One thing had become apparent, we shared a common faith with Christians who had no hip hop connection, and we shared certain aspects of a common culture with those who had a deep hip hop connection. This delicate balance is learned over time and through much biblical searching. When the Christian faith is properly integrated with any culture, a beautiful and biblical combination is there present. The fact that our anchoring faith could be lived out through our indigenous culture was news that we had hoped and prayed for. We had no desire to go off to the side and “do our little hip hop thing,” we wanted to be accepted as apart of the nucleus of the church by our elders and leaders in the faith. We expected to run into some immature people in Christ who would not be able to get beyond our exterior because we see so much of this in the bible. Biblically speaking, one of the marks of spiritual immaturity is a faulty value system. The Corinthians measured value and status the same way their surrounding culture did, so like the culture and unlike God, they despised small and weak things. In our present day, I believe something similar is happening. God sees the Christian in hip hop one way, and the church sees us the opposite way. The church can sometimes tend to esteem the appearance of godliness more than godliness itself. When this happens some people judge our Christianity by our appearance, while others will evaluate us on the bases of our faith, conduct, speech and character. Until recently the Christian hip hopper was enjoying a time of harmony within the church. A glorious example of Ephesians 2:13-16 was in full blaze—one new man made up formerly opposing people groups. Sure, things have not been perfect, but we experienced a time of relative peace between the older generation of believers and this younger generation of believers. 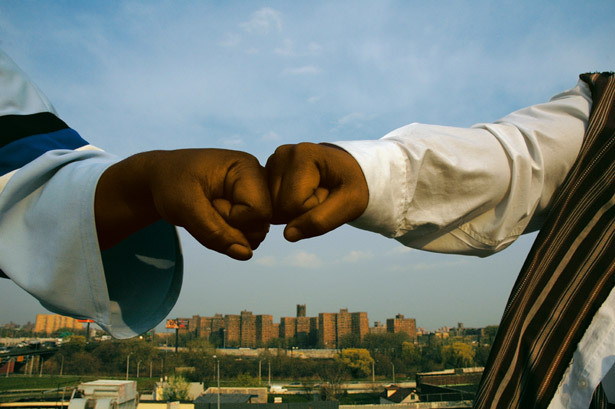 Our connection to the non-sinful aspects of hip hop culture was no barrier to our fellowship; in fact this was the key to a strategic partnership. A ministry like Cross Movement was able not only to rise under these conditions, but also flourish. God used us to spread Christ-centeredness through the means of hip hop music and many believers were strengthened in their resolve to be unashamed Christian witnesses. Hip hop provided us, and groups like ours, the platform to communicate our biblical affections to the hip hop generation and beyond. We were proud to bear the name Christian, and we welcomed being the smell of death to some and the smell of life to others (2 Cor 2:15-16). After many years of faithful service, CM and others were developing “family credibility.” The church was embracing us and we embraced the church. The church encouraged us to glorify God in our uniqueness while maintaining a commitment to Christian unity. We aspired to do just that. We sought to maintain an oneness with Christians through the centuries while still fulfilling a God given obligation to the surrounding mission field of hip hop culture. Our mission field has been, and will continue to be the very context that God called us in—the hip hop context. We have been informing this contingent that the church at large is taking an interest in their souls. However, true religion as the apostle James reminds us, is not primarily mystical. True Christianity acknowledges a person’s spiritual and social needs. The world is not accustomed to seeing a hip hop that has been sifted through God’s word. They only know godless rap and godless hip hop culture. For many of them the thought that God will accept them is far-fetched. To the hip hop generation we announce that they can become apart of God’s family without being totally stripped of their social identity. This great news is now being frustrated by the recent attack on the whole concept of “Christ and hip hop” or “Christian hip hop.” As Christians and church leaders develop distaste for Christian hip hop, the church moves further away from the idea of using the Christian hip hopper as a missionary to the hip hop generation, or making a place for Christian hip hop converts. While we are not defending hip hop, we are reminding people of the biblical principle of unity and diversity, the reconciliation of all things, and the rights of all people to enjoy God within the context of their natural elements (as long as those elements are not sinful). We do not deny the sinfulness that exists in the hip hop culture. We do not minimize the crimes committed by the culture, and we have no intention of defending hip hop in the least bit. We simply want to stress that hip hop needs the gospel, and that means hip hop needs indigenous Christian missionaries. Those of us that are Christians of the hip hop generation, desire to display a version of the culture that is absent of the sins that the secular culture has become known for. We want to surrender our culture to the lordship of Christ so that He can use it for his redemptive purposes. We need the whole church to do this. We are asking the church to stay tuned for the implications of properly viewing the relationship of Christians to hip hop. There are too many implications to even begin addressing at this point. However, don’t let your fear or lack of understanding make you a hard hearted skeptic. Let the Scriptures be brought to bear on the subject. Allow me and many of my associates to lay the issue out for you socially, theologically and missionally, and we will all see God glorified among a people that were not his people. WHY DO WE HAVE TO USE THE TERM CHRISTIAN HIP HOP, WHY CAN’T WE JUST CALL IT CHRISTIAN RAP? “Why can’t we call it Christian rap instead of using the word “hip hop”. People are being persuaded that God is cool with Christian rap, but not with Christian hip hop. The argument goes, “Rap is just music, and hip hop is sinful culture, so God will accept Christianized music, but he will not have anything to do with a sinful culture.” This is more than an issue of semantics; this is an issue of Christian perspective. Whether we are dealing with music or a culture, God can transform it and get glory from it. The transformation of music is as simple as redirecting the music to reflect and promote God’s mindset through the lyrics and goal of the song. The transformation of culture requires the transformation of people because people are at the heart of culture. This process is much more complicated which is probably why many people would rather not even deal with this part. When it’s music—“just change the words.” When dealing with culture you’ve got to change the heart, and this something that only God can do. However he does it through people and that is where you and I come in. The church has to decide whether or not to throw the culture out with the sins, or address the sins in order to see a change in the culture. Within the church, the term hip hop is becoming taboo. Even using the term “Christian hip hop” is taboo for some. When people express a desire to substitute the term rap for hip hop I always find this interesting since both terms, rap and hip hop, were coined by the secular world. So if both things and both terms have a secular origin, why are we struggling between which one a Christian can and cannot “Christianize.” Something fishy is going on, and it seems to me that the same people that clearly hate or dislike hip hop, apparently like rap. They can kick hip hop to the curb but they want to hold on to their rap. Since they don’t want to ruin their chances of enjoying Christian rap they convince people that God is not opposed to Christian rap. While they say this, they insist that he is opposed to Christian hip hop. Now we know that secular rap and secular hip hop are both godless. We also know that some Christian rap and rappers are godless as well. So how is it that we keep hearing some Christians say that we can keep rap if it is submitted to Christ, but hip hop can’t even be submitted to Christ? You say, “Rap is just music, but hip hop is a sinful culture (way of life).” You are right about both things, but many of you refuse to believe that sin is not inherent to the original agenda of hip hop (that can be fully defended another time). Hip hop originally was just a combination of four platforms of expression, capable of serving whoever got the crowd’s attention. Like money—money is not evil, but it simply magnifies the abilities of the one in control of it. In the hands of terrorist money can be used to fund diabolical acts, in the hands of the church it can be used to carry out the Great Commission. Likewise, hip hop (a more comprehensive way of expressing yourself) as well as rap (a single format for expressing yourself) can be used to carry out the agenda of Satan or Jesus. Did you read that? Even one of the pivotal and earliest influencers of hip hop (who’s not a Christian) declares that there is a difference between what we see being perpetrated in hip hop, and what hip hop really is. Hip hop is a servant of whoever is setting its agenda, and right now the world is setting its agenda. But in Christian hip hop, some of us diligently strive to insure that Christ sets the agenda. Hip hop is no more than the tint through which the light of God’s glory can shine. We know that God’s truth alone changes lives, but preaching has been describes as “truth poured through personality.” The “personality” is not the truth, but it is simply the means of providing variety in God’s diverse world. People are at the root of culture, and neither people nor their culture can just be thrown away. Aspects of their culture can be discarded when those aspects offend God, but you cannot force total cultural assimilation on any group. You see it’s easy to throw away something you don’t care about, but it’s hard to let go of something you feel an attachment to. It is even in Craig Lewis’ interest to make people believe that Christian rap is ok, because he produces Christian rap and he supports his own Christian rappers (how convenient?). I don’t expect him to relent from his position, but many of you are just being dragged through the mud of his unbiblical positions without really allowing someone who knows both the Bible and the issue of hip hop culture to help you work through a biblical understanding of this issue. Please recognize that it may sound spiritual to boycott every secular contribution to humanity, but THIS IS NOT SPIRITUAL BECAUSE THIS IS NOT BIBLICAL! Don’t mistake me for advocating godless secularism, but I do know that many Christians know that everything secular is not inherently sinful or off-limits to the Christian. The term secular can be used simply to describe “that which is not specifically related to religion or to a religious body.” That includes words like “basketball,” “book,” “music,” and other terms that are not necessarily religious in their use. Rap and hip hop are secular, but both can be sanctified by God and made profitable for the Christian. When people cynically ask, “What is Christian music,” what are “Christian plays,” what are “Christian bookstores?” I believe they are asking the wrong question. The question is, what we mean when we say “Christian bookstore,” “Christian plays,” or “Christian music”? Everyone ought to know that in these cases “Christian” is being used as an adjective or a modifier, which is then placed in front of everyday things, to add to, or alter what you would normally think of when you hear those generic things. For example, music today is normally a carrier of godless ideas, “Christian music” claims to carry godly ideas. Regular colleges are usually full of orgies, cheating, and anti/unbiblical education, but Christian college at least seeks to be, and facilitate the opposite of these things. My point is that the negative aspects of these things don’t automatically force Christians to invent some other word for these things, that is impractical and it is nowhere prescribed in Scripture. However, Christians have often given terms new meaning or higher meaning than the culture around them. The term “church” was a secular term, and Jesus said that he was going to build His church. In the secular world the cross has a negative stigma for being either an offense or foolish, but God did not stay clear of it. Instead he made that which was shameful and foolish, glorious and wise. I AM IN NO WAY EQUATING THE CROSS AND HIP HOP, but I’m just illustrating the way in which believers can take something common, and modify its meaning. In our culture we use modifying words such as adjectives. There is hip hop, but we do Christian hip hop. YOU ARE SPIRITUAL, BUT ARE YOU SOCIAL? If Christian is a term to describe your faith and your true spiritual identity then you are in good standing before God, but what is your connection to your social surroundings? Christians are prone to want to love God, and disconnect from people. We usually do this because we think that they are so sinful that God has given us permission to treat them like they have the plague. Guess what, we were designed to have vertical (God-ward), and horizontal (social) connectedness. We were not left in a totally Christian world, but we were left in a secular world, with a charge to impart our faith into every culture (Matt. 28:19-20; Ac 1:8). That means there will be a social connectedness with mankind (Christian and non-Christian). People are quick to point out the sinfulness of hip hop culture, and I am quick to agree. Hip hop is sinful, but so is every culture. No earthly culture would be cool to identify with if sin was an automatic disqualifier. We could not say that we are African or American because both of these broader cultural contexts, as well as the subcultures within them, are riddled with sin. However, the Bible teaches that cultures are free to develop, but that the sinfulness must be addressed by the transforming power of God’s Spirit. Hip hop does not need a defense, and Christian hip hop is the free choice of the believers who want to use this concept to capture both a spiritual and social identity. Please people, understand the issue. We are not defending hip hop or seeking to imitate the world. We are in Christ, I hope when you see us you can tell. We live in the world, and I hope that when you see us you can tell. It just so happens to be that for the Christian hip hopper, he/she is in Christ and in a hip hop oriented world—that should explain things. 1 “Rap and Hip-Hop Guide,” online: http:/rap.about.com, accessed 13 July 2004. Your comments are invited below!